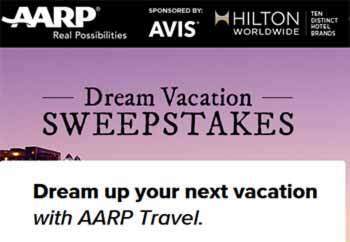 AARP.org – AARP Dream Vacation Sweepstakes. The membership organization is well known for their website that offers great how to information, advocacy and service for people over 50 in term of health, insurance and retirement. They are also known for their popular online games and sweepstakes section. Now lets talk about their latest sweepstakes! How about being the next winner that American Association of Retired Persons (AARP) is looking for. How about winning a travel prize sounds to you? Well AARP is not only giving away one Travel prize but TEN. Indeed you have the chance to win one of their ten travel prizes to a great world destination. So, If you’re over the age of 45, you could win one of ten amazing vacations. Here’s the list of these wonderful destination: A)European River Cruise for two trip package or B)Alaskan cruise for two trip package or C)A trip for two London and Italy or D)A Canadian Rockies trip for two trip package or E)A trip for six people to Disney World in Orlando, FL. trip package or F)A trip for two to Las Vegas, NV. Trip package or G)A trip for two to Riviera Maya, Mexico. Trip package or H)A California road trip for four trip package or I)Caribbean Cruise for two trip package or J)A trip for two to Honolulu, Hawaii trip package. 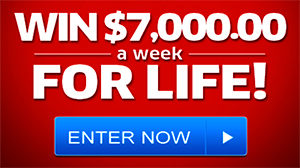 WIN $2 MILLION PLUS MORE! Yep I want to Win. All that money would be wonderful and I could help so manpeople in so many ways but At 80 years old I am very comfortable in my own home. Think of all the hardships it took for us to have what we do have and we did it together, has taken almost 62 years but I’m very happy here. it will be easier to stay humble living where are. Money sounds wonderfultho! I WOULD LOVE TO WIN IT ALL BECAUSE ,I WOULD PAY OFF SCHOOL LOAN ON MY CREDIT CARD.PAY OFF CAR LOAN. PAY OFF THE HOUSE. GIVE SOME TO MY CHURCH,ALSO SOME FOR THE YOUTH GROUP FUND! THEN GO TO SEE MY SON IN AZ. THEN I WOULD HELP THE HOMELESS IN MY TOWN! It would be nice to Win the SUPERPRIZE or anything. I need to win the sweepstake prize. I want to win double the amount and a dream vacation. And the dream house. Thank. You. Give it to my church, some to animal shelters take care of others and pay my mortgage, bills and go o trips. I would give some to my church, animal agencies, pay off bills, help the hungry and complete my mortgage. Go on some trips and help. I will keep trying until I get my entry that I need for the win it all sweepstake.